TUCSON, Ariz. — Arizona Republican Congresswoman Martha McSally called on the national GOP to "grow a pair of ovaries" as she launched her bid for the U.S. Senate on Friday, joining the race to replace retiring GOP Sen. Jeff Flake by embracing President Trump and his outsider playbook in one of the nation's premier Senate contests. Like few others, the Arizona election is expected to showcase the feud between the Republican Party's establishment and its fiery anti-immigration wing in particular — all in a border state that features one of the nation's largest Hispanic populations. McSally, a two-term congresswoman already backed by many GOP leaders in Arizona and Washington, described herself as anything but an establishment candidate in a fiery announcement video that touched on border security and Sharia law and featured Trump himself. "Like our president, I'm tired of PC politicians and their BS excuses," McSally charged in in the video. "I'm a fighter pilot and I talk like one." "That's why I told Washington Republicans to grow a pair of ovaries and get the job done," she added. "Now, I am running for the Senate to fight the fights that must be won — on national security, economic security and border security." Later in the day, McSally, a retired Air Force colonel and the first female fighter pilot to fly a combat mission, plans to fly herself across Arizona to announce her candidacy before voters in Tucson, Phoenix and Prescott. The election will test the appeal of the Trump political playbook — which emphasizes the dangers of illegal immigration and demands border security above all else — in a state where nearly 1 in 3 residents is Hispanic and roughly 1 million are eligible to vote, according to the Pew Research Center. Trump won Arizona in 2016 by less than 4 points. McSally, 51, enters a dynamic Republican primary field that features a nationally celebrated immigration hardliner, 85-year-old former Arizona Sheriff Joe Arpaio, who was pardoned by Trump himself last year after intentionally defying a judge's order to stop traffic patrols that targeted immigrants. The primary also includes former state Sen. Kelli Ward, an outspoken Trump advocate who was an early favorite of now-disgraced former Trump adviser Steve Bannon. Despite the aggressive rhetoric in her announcement video, some of McSally's conservative critics dismiss her as an establishment favorite whose record doesn't match the tough talk in her announcement. She refused to endorse Trump in the 2016 presidential campaign. "That's just not how leaders carry themselves," she said at the time. Yet she has tacked right in recent months and aligned herself with Trump as the 2018 campaign season neared. McSally co-sponsored an immigration plan released by House conservatives this week that would reduce legal immigration levels by 25 percent, block federal grants to "sanctuary cities" and restrict the number of relatives that immigrants already in the U.S. can bring here. The bill, which is unlikely to survive the GOP-controlled Senate, also provides temporary legal status for young immigrants enrolled in the Deferred Action for Childhood Arrivals, or DACA, program. Democrats see Arizona as a rare opportunity to pick up a Senate seat in 2018 as their party struggles to defend vulnerable incumbents in several other Republican-leaning states. Democrats have another advantage: Their party's leading candidate early on, three-term incumbent Rep. Kyrsten Sinema, faces a relatively weak Democratic field, while McSally and her Republican opponents are expected to wage a bloody and bruising Republican contest until the state's late August primary elections. But McSally avoids her Republican opponents altogether in her announcement video, focusing instead on her military service while adding a jab at Sharia law — a reference to her fight against a military policy that required female soldiers in some Muslim-majority countries to wear robes over their service uniforms. "I absolutely refused to bow down to Sharia law," she said. "After eight years of fighting, I won my battle for the religious freedom of American servicewomen." She added, "After taking on terrorists in combat, the liberals in the Senate won't scare me one bit." 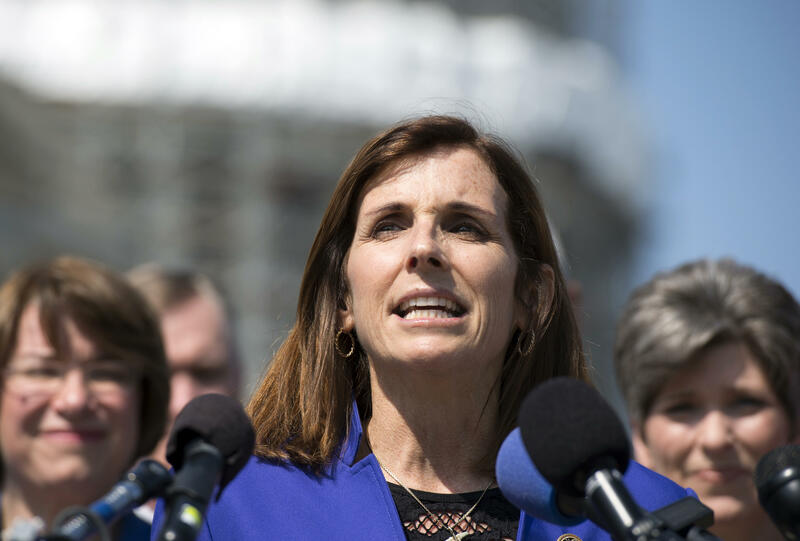 While some Trump loyalists and conservative groups don't necessarily agree, McSally is viewed as the stronger Republican candidate in a general election, when successful candidates extend their appeal beyond their party's most passionate voters. McSally is the only "truly viable candidate" so far, said Jay Heiler, a Republican who has been considering jumping into the race. Yet backed by a cult-like nationwide following, Arpaio could be a major factor. Former state GOP chair Robert Graham, said the former sheriff's candidacy fundamentally changed the primary dynamics. "When he goes into those rural communities, he is just mobbed, and in a positive way," Graham said. "They really embrace him." Democrats, meanwhile, are practically giddy about what they view as a race to the right in the Republican field that could make it difficult for the primary winner to prevail in November. "Whoever escapes the GOP primary in August, they will be held accountable for touting their radical stripes at every opportunity and willingness to take stances on issues that are simply out of touch with Arizonan voters," state Democratic Party spokesman Drew Anderson said.